Today’s success story was submitted by Jenny from Something New. You can see before photos with my tips about Jenny’s spare room here, and before photos with my advice about her baby gear in this post. Thank you so so much for your reply and ideas! I hadn’t even thought that a future baby may not be interested in the those items and will discuss this further with my husband. Unfortunately, the shed is still not an option. However, after writing to you, reading some of your other motivating posts, and starting to read Created to be His Help Meet by Debi Pearl, I got inspired to solve the problem quickly! It turns out that all of the baby toys except the large swing could be folded down with some work. I rearranged my son’s closet and made room for the toys in there. Then I took apart the swing the best I could and placed it on top of one of our Christmas totes, freeing up so much floor space! 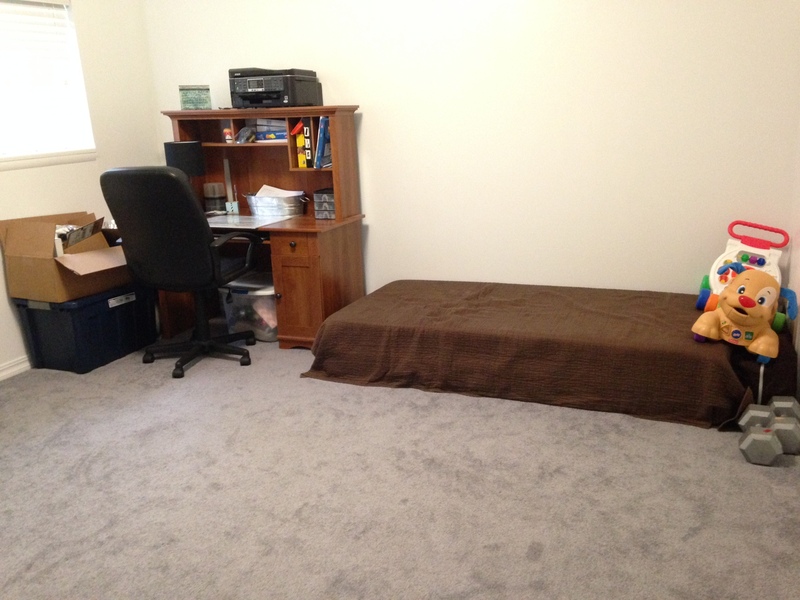 I moved empty bins from my son’s room onto the large bookshelf in the spare room. Then I put toys, blankets, and craft items from the desk into the bins. 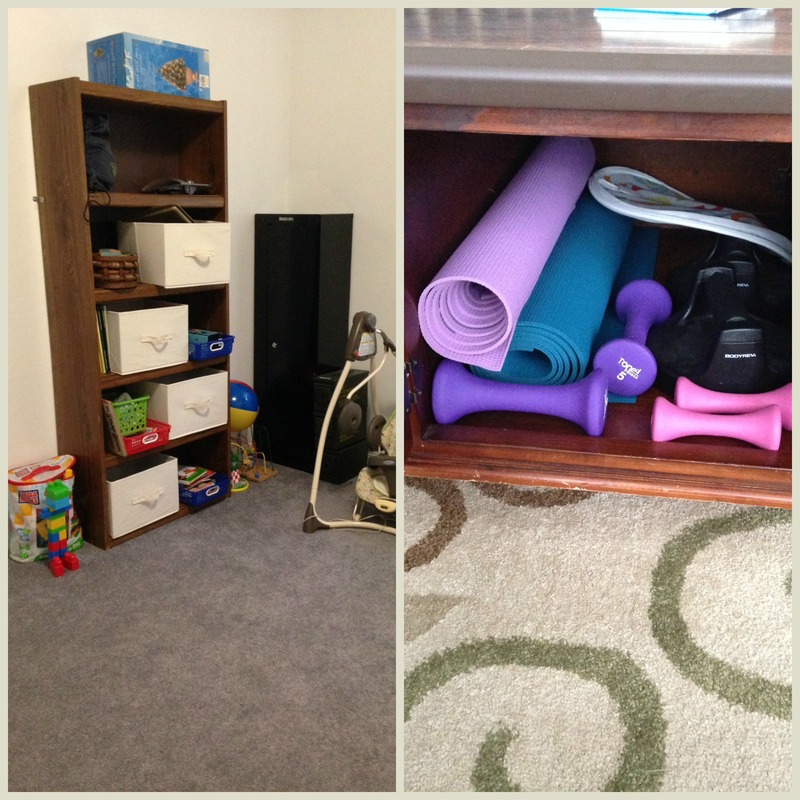 I also moved some larger toys from in our living room coffee table into the spare room, which made space in the living room for exercise equipment. So now all of my workout things are right where I need them to be – with the TV! It is so wonderful to have space in our spare room and my son already loves going back there to play with his toys by himself or with us! We’ve already had more fun family experiences in that room than we used to! I even started using some empty bins in our large hall storage closet for donations and consignment items. The rule is to deliver the items when the bins are full. I also made more room in our living room by moving our dining room table bench out into the mudroom. 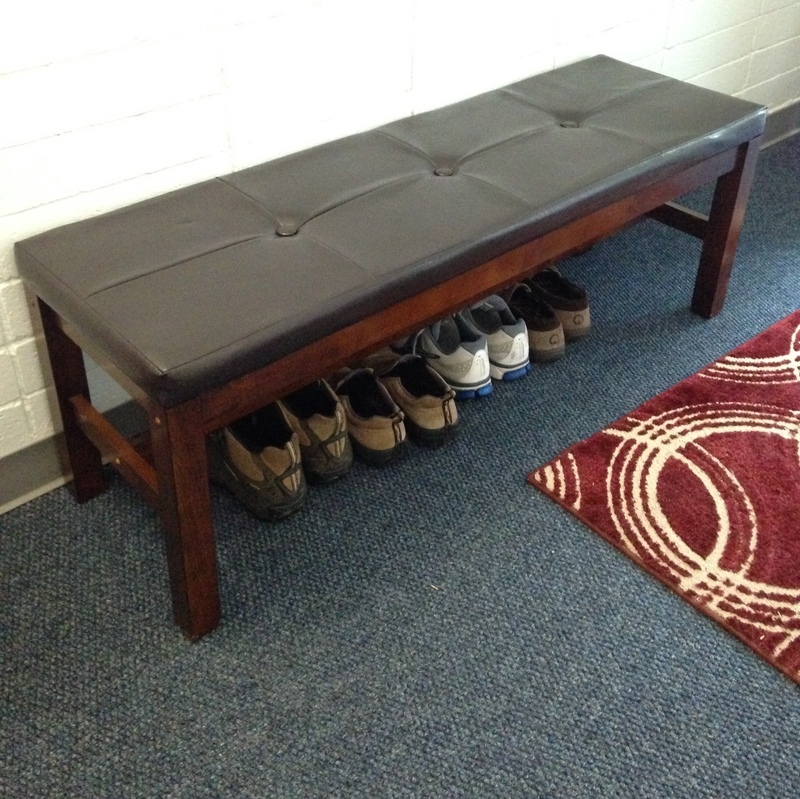 This makes an awesome place for people to sit and put on/take off their shoes! Well, now that I started I can’t stop organizing things. Just today I reorganized our bathroom closet and found some more storage containers that weren’t really being used in there for our desk area and spare room storage. Thank you so much for all the inspiration and motivation, and especially for helping to open up space for our family to live. I wouldn’t have done any of it if I hadn’t stumbled onto your blog! I would like to note it was especially helpful to read ideas from someone who has truly struggled with cleaning and organization too. 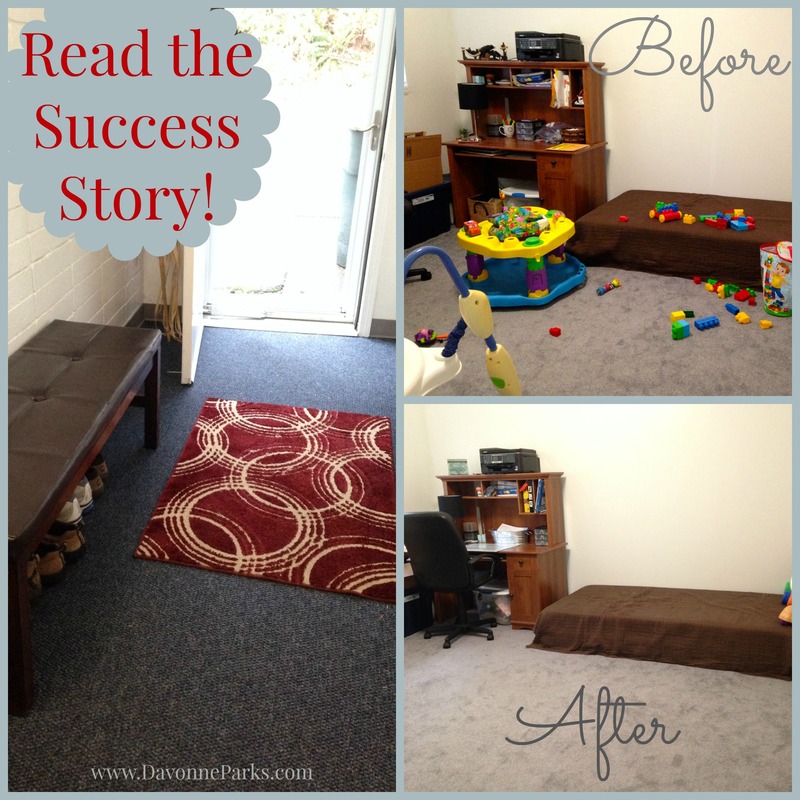 Jenny, thank you so much for sharing your success story! Your home looks amazing and your $5.00 Amazon gift card should be in your inbox! Readers, if you want to receive FREE personalized organization tips for your own home, then check out my Get Organized page for details on how to submit your questions! Want immediate and complete organization help? My eBook Chaos to Clutter-Free is only $2.99 through the end of January.